A great number of things conspire to hold the vibrant Boston music scene aloft like Lando Calrissian's Cloud City. Sure, people and even institutions do come and go, but certain of them endure, and constitute a superstructure that lifts all of us invested in the music community here. A key piece of it all is local radio -- often college radio, but we can't forget our friends that have festooned the commercial spectrum past and present. We're, of course, talking about our beloved Pipeline on WMBR, Anngelle Wood's Boston Emissions on WZLX, and even the upstart VanyaRadio. And we simply can't have this conversation without talking about WMFO and its long-running program On The Town with Mikey Dee. 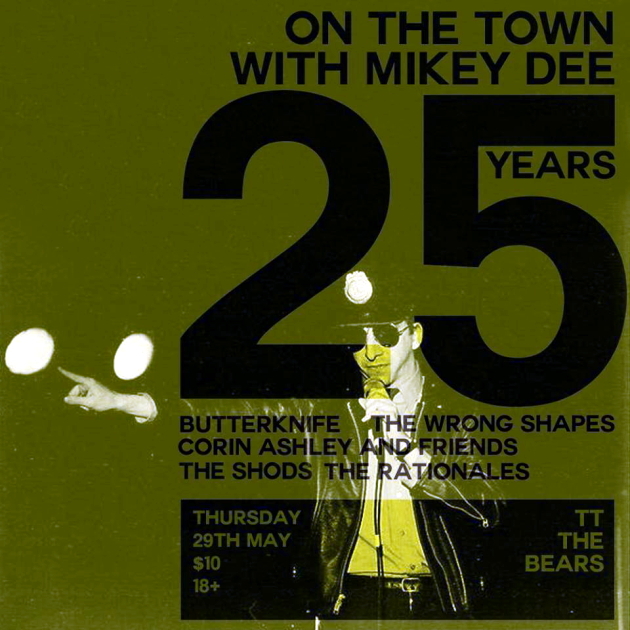 The show, which sadly lost its namesake due to illness in 2003, tonight celebrates at TT The Bear's Place a quarter-century of providing a platform for local acts to perform live on the air and cast their sizzle across the airwaves to the rock and roll people, the kids, and the occasional interested hound dog, even. Sound engineer and polybandist (we just made that up) Joel Simches has curated tonight's bill, which features the classic power pop of Corin Ashley, the dreamy and tribal ruminations of The Wrong Shapes, the anthemic emo of Class of 2014 Rock And Roll Rumblers Butterknife, the ready-steady rock of The Rationales and punk rock from the nearly-as-old-as-the-show The Shods. As part of the anniversary celebration, the audio vaults were raided and the result is a two-CD compilation of songs recorded live on the show; not coincidentally that collection, titled Live From Studio Dee: The Very Best Of On The Town with Mikey Dee, is available starting today. Rock fans can stream selections from the set via the Bandcamp embed below. Proceeds from the sale of the CDs get poured right back into the coffers of WMFO, which in turn will pour more music right down your earholes daily, so everyone wins, right? Right. Here's the Facebook event page for the show, which we heartily endorse. Those interested in receiving extra credit are directed to the second embed below, via which you can stream an electrifying, cello-fied 2009 live set performed for on On The Town by Clicky Clicky faves Varsity Drag.